Sallie Mae reports that American families are finding various ways to cut college costs. They are relying more on out-of-pocket contributions and less on student loans. How America Pays for College 2014 finds that families are adopting multiple strategies to reduce the cost burden of paying for college, such as opting for in-state tuition (69%), living closer to home (61%) or at home/with relatives (54%), filing for education tax credits (42%), getting a roommate (41%)6, accelerating the pace of coursework (28%), or not deferring payments on student loans (23%). Not only was the choice of an in-state school the most frequently mentioned response, it is also most likely to be mentioned if only one cost-saving measure is adopted by the family. Most families, however, are likely to adopt a combination of cost-reduction approaches, such as opting to go to school in state and living at home or with relatives (43%). Paying from current income and savings increased while borrowing decreased. A significant source of college funding comes from the income and savings of families known generally as “out-of-pocket” contributions. In 2014, American families reported that out-of-pocket spending from parents and student combined was $8,850, accounting for 42% of the total amount paid for college. This breaks a three-year trend in decreasing out-of-pocket spending (46% in 2010, 41% in 2011, 40% in 2012, and 38% in 2013). Compared to 2013, American families increased their contributions from income and savings by $839 while decreasing the total spent on college by $295. Families’ use of borrowed money used to pay for college in 2014—a combined parent and student amount of $4,610— dropped to the lowest it has been in five years. 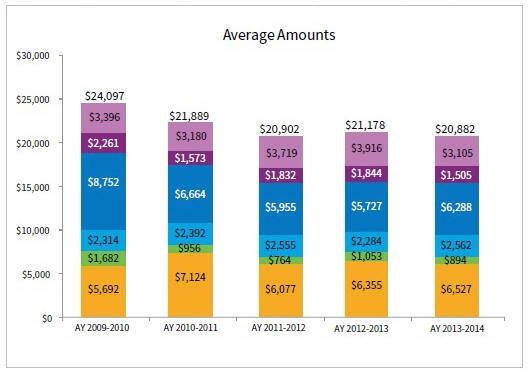 Borrowed funds paid for 22 percent of college costs in 2013-14, a decline from 27 percent the prior year. 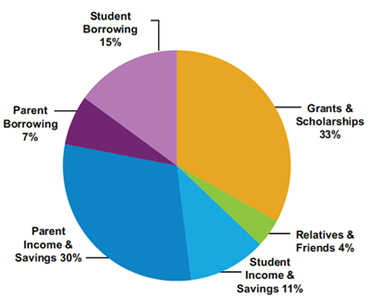 Student borrowing (15%) accounted for twice as much as parent borrowing (7%). 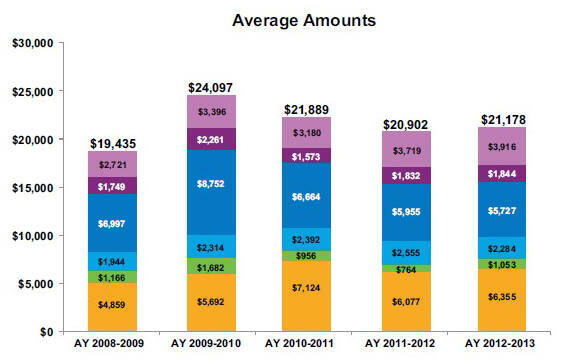 How America Pays for College 2014, Sallie Mae & Ipsos Public Affairs, August 2014. 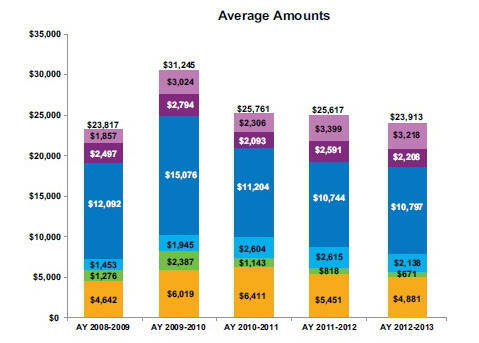 The use of grants and scholarship to pay for college is on the rise. The percentage of families using grants and scholarships for college has increased 30% from five years ago. According to student loan servicer Sallie Mae, nearly two-thirds of families (65%) used grants and scholarships to pay for college in 2013, up from 61% in 2012 and up from only half of families five years ago. What’s more, 49% of parents say they’re not regularly setting aside money to college savings, and 70% of those parents say the reason they’re not saving is because they simply can’t afford to. In other words: more and more families are counting on grants and scholarships (including tuition discounts from the school itself) to pay for college. The percentage of students who borrow for college has increased a more modest 10% from five years ago. 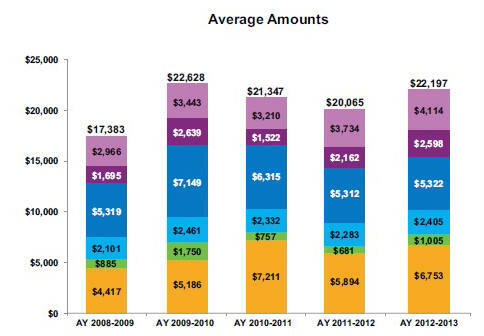 In 2013 32% of students borrowed to pay for college, up from 29% in 2009. Parent borrowing is down over that same time, from 15% in 2009 to 12% in 2013. Maggie McGrath, “10 Rules For Decoding College Financial Aid Award Letters”, Forbes, 3/31/14. 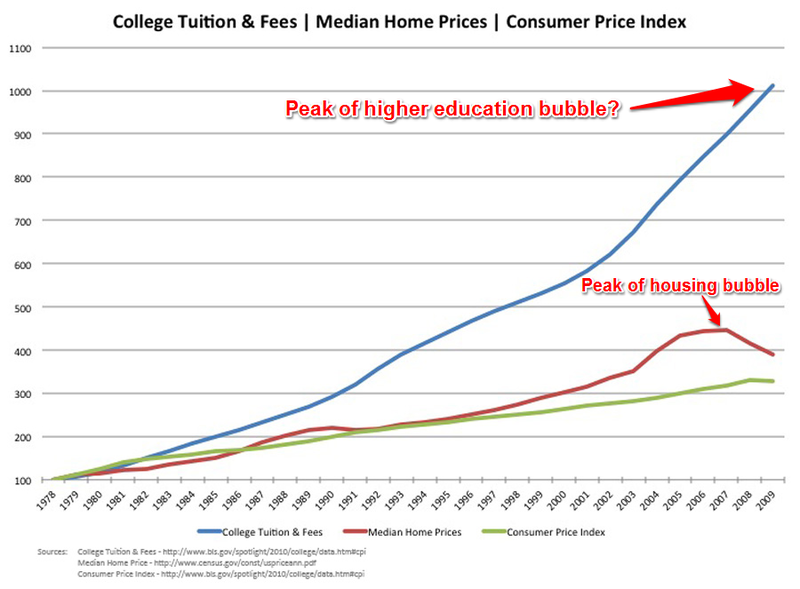 Sign of a student loan bubble starting to burst? Student borrowers are facing fewer choices. JPMorgan Chase has sent a memorandum to colleges notifying them that the bank will stop making new student loans in October,according to Reuters.…. “We just don’t see this as a market that we can significantly grow,” Thasunda Duckett tells Reuters…. Remember the housing bubble that peaked in 2007? Student loan debt has more than tripled over the last ten years. There is over $1 trillion in outstanding student loans, making it the second largest source of household debt after mortgages. Just 10 years ago, student loans stood at $240 billion. About $150 billion of the total is comprised of private student loans made by banks and other financial institutions, according to a report issued by the Consumer Finance Protection Bureau last year. The CFPB reported that around $8 billion of private student loans were in default. That number is likely to go higher if interest rates rise because most private student loans, unlike federal loans, are variable rate loans linked to Libor or the prime rate. Which institutions are still in the private student loan business? JPMorgan’s actually the second big private lender to step away from the business. Last year US Bancorp exited the business. That leaves Wells Fargo & Co.,Discover Financial Services Inc., PNC Financial Services Group, SunTrust Banks Inc., and various credit unions as the largest private student lenders. Oh, and of course, Sallie Mae, which was privatized in 2004. We’ll have to stay tuned to see any more departures, but some data suggest a trend toward a deflating bubble. Posted in financial aid, higher education bubble, need-based aid, student loans, trends | Comments Off on Sign of a student loan bubble starting to burst? A report from Sallie Mae shows how families from different income levels have been paying for college over the last five years. High-income families have cut down on their college spending. Overall, parents are contributing less toward their children’s college education, but from these charts it’s clear the decline has mainly occurred among higher income families. Over the last five years, parent contributions have actually increased 43% for low-income families while decreasing 10% for high-income families. Low-income families receive more grants. Even with the recent rise in merit aid, lower-income families continue to received relatively generous amounts of grant and scholarship awards. * For the purposes of this study, low-income families have been defined as those with an annual household income of less than $35,000, middle-income are families with an annual income from $35,000 to less than $100,000, and high-income families are those with an annual income of $100,000 or more. As “we’ve entered into a different era with regard to how families approach paying for college“, parents are contributing less toward their kids’ college education. This is one of the findings of How America Pays for College 2013, a Sallie Mae study that was released earlier this month. Parents are giving their children less cash to pay for college amid continued economic weakness, adding to pressure on students to borrow money, rely more on grants and scholarships—and in many cases, live at home. Parents shelled out an average of $5,727 from their income and savings for each child’s college costs in the 2012-2013 academic year, down more than a third from $8,752 in 2009-2010, according to an annual report on college funding by student loan provider Sallie Mae to be released on Tuesday. The share of college costs paid by parents out of income and savings fell to 27% from 37% three years ago. The figures don’t include borrowing by parents, which also declined slightly in the period. This strikes me as a significant change, given the high priority parents place on providing for their children’s higher education. … Being able to pay for a child’s education is an important long-term financial goal for most parents of school-aged children. Among all parents with at least one child under age 18, eight-in-ten say this is an extremely important (35%) or very important (45%) goal. “Parents are still willing to stretch themselves financially, but their incomes just haven’t kept up,” said Sarah Ducich, senior vice president for public policy at Sallie Mae. More students are living at home to save money. At the same time, more students are rejecting college dormitories. In 2013, 57% of families reported a student living at home or with a relative, up from 43% three years ago. Students from low-income households have traditionally lived at home in larger numbers, but among families with incomes over $100,000, the share of students staying at home has doubled to 48% since 2009-2010. The number of families saving for college has dropped to 50%. 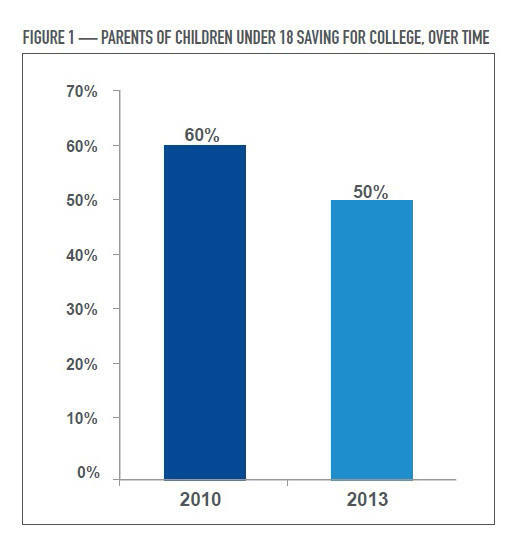 Not only did fewer families save for college last year, but they also saved less. Parents who saved have socked away almost $12,000 total last year, a sharp drop from over $20,000 reported in 2010. That might explain why only 55% of those who are saving for college said this year that they feel confident about being able to cover the costs. Most parents expect their children to get scholarships and grants, which on average have dropped to about $6,000 per student. 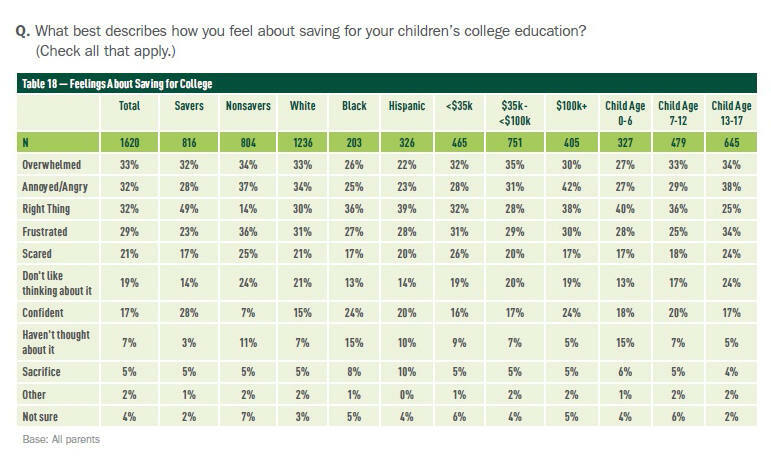 For those parents who aren’t saving for college, 53% say a major reason is that they can’t afford it. Another 18% cite that as a minor reason, while 13% say a lack of money plays no role in their college-savings decision. More than half of nonsavers say they’re not saving at least in part because they expect their children to receive scholarships and grants to cover college costs. But that’s a risky calculation to make, as the average amount of funding U.S. undergraduates got from grants and scholarships fell 15% during the last academic year. On average, students received $6,077 in grants and scholarships in the 2011-2012 academic year, down from $7,124 a year earlier, according to a July Sallie Mae study. Whatever their income level, non-savers say they simply don’t have the money for college. Only 38% of parents feel confident about meeting the costs of college. Many feel overwhelmed, annoyed, angry, or frustrated. “Shadow debt” consisting of loans not captured in traditional reporting should be taken into account when the impact of rising college costs on families is considered. A comment on CollegeConfidential explained it this way. There’s several different ways to borrow for college which won’t show up with the current data mining techniques. Given parent plus loans are fairly expensive (relative to this low rate environment) parents might be finding cheaper ways to borrow. Interest rates on unsubsidized Stafford loans are 6.8% and Parent Plus loans are 7.9%. By comparison, home equity rates averaged 4.58% this week. Anecdotally, I can think of at least three families that have tapped into their home equity to help pay college tuition. I borrowed from a relative when I was in college. How much student debt goes unreported? The question arises, then, of how much shadow student debt goes unreported. Andrew Gillen did a back of the envelope calculation, based on Sallie Mae’s reporting of how families pay for college. He concluded that the official student loan figures should be bumped up by about 31%. I did a similar calculation and came up with a factor of 28%. Official student debt figure has been reported to be more than $1 trillion. Although it’s unclear whether it should be bumped up by 10%, 30%, or 100%, I’m convinced that a substantial amount of college debt is going unreported. College students are borrowing a higher share of costs as their parents cut back on college spending. A study released Monday by the country’s largest student lender shows parents spending less on college costs and students shouldering more of the burden, a trend that demonstrates how families are strategizing to cut college expenses…. Parents spent an average $5,955 on college from their income and savings, results showed. That was down from $6,664 a year earlier and $8,752 the year before. They also borrowed slightly more — $1,832 compared with $1,573 in the 2010-11 survey — although that was still less than they did two years ago. Students took on more of the burden by digging deeper into their own funds. They spent an average $2,555 on college from their savings and income in the last academic year, up from $1,944 the previous year. But their spending wasn’t enough to make up for cutbacks by their parents. All told, parents funded 37 percent of college costs through spending or borrowing, down from 47 percent two years ago. Students accounted for 30 percent; grants and scholarships footed 29 percent; and relatives and friends paid for 4 percent, according to the survey. Given the rising cost of college, saving for a child’s education has become a daunting task for many parents. Being able to pay for a child’s education is an important long-term financial goal for most parents of school-aged children. Among all parents with at least one child under age 18, eight-in-ten say this is an extremely important (35%) or very important (45%) goal. More students from upper-income families are commuting from home, foregoing the luxury of going away to college. Just over half of the students in the survey lived at home while they attended college this year, up almost 9 percent from a year ago. Most of that increase was accounted for by families with income of more than $100,000. Community colleges are becoming a more popular option. A shift toward two-year colleges also was evident for a second straight year, Sallie Mae said. Respondents included 29 percent who attended two-year public schools, up from 21 percent the previous year. Virtually all families reported taking cost-savings measures, such as attending lower-cost colleges, living at home, or going to school part time. On average, families reported paying 9 percent less for college than they had the previous year. Parent sources, including savings, income and loans, funded the largest segment of the average family’s total college expenses, at 37 percent. Students assumed direct responsibility for about one-quarter of the total cost of college, contributing 11 percent from income and savings and 15 percent through borrowing. 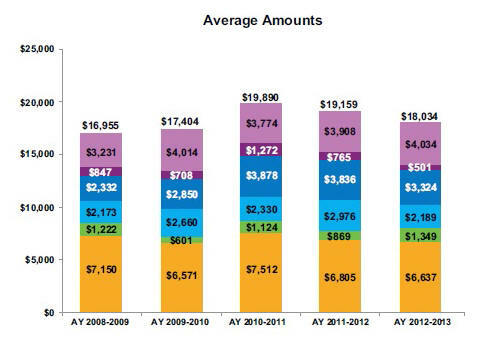 Grants and scholarships covered 33 percent of college costs in 2010-2011, up from 23 percent the previous year. In our family, it appears that our first college student will be borrowing a little more than what the average student does. According to Mark Kantrowitz, founder of FinAid.org, a good rule of thumb is that “total debt at graduation should not exceed your child’s expected starting salary” upon graduation.